hahahah… #2 is my favorite! .-= Sonia P´s last blog ..Crocchette: crispy, cheesy and just plain YUM! =-. This is an excellent line of reasoning, René! Nom nom nom. Nutella: nutty in a GOOD way. .-= Katja | Driving Like a Maniac´s last blog ..Oh, the shame! =-. This has to be the best list of reasons to eat Nutella ever!!!!!!!!!!! .-= Lisa at Wanderlust Women´s last blog ..Wanderlust women will find a city of contrasts in Naples, Italy =-. .-= nyc/caribbean ragazza´s last blog ..Angèlique Kidjo at Parco della Musica, with a special guest appearance from Carmen Consoli =-. Thanks for coming by Ninotchka! This is awesome…thanks for sharing! Glad you enjoyed…now I must see about cooking that GOAT! .-= The Food Hunter´s last blog ..Silly Conversations That Come Up When You Decide to Cook a Goat…. =-. Oh I don’t know if Nutella is better than a dog…that’s a tough call! .-= Kristine´s last blog ..February Designs =-. 1. He never complains about how many pairs of shoes you own and whether or not you wear them. 2. He comforts you when you’re hormonal and never ever complains about it. .-= Dory´s last blog ..44 Lessons I’ve learned =-. So there is nothing wrong with my love for Nutella! Thanks, thanks, many thanks Michelle! .-= O. the Expat Mom´s last blog ..How to survive when husband is gone over the weekend =-. This was funny thanks-I will be joining you in spirit for Nutella Day-sorry I have been in trial since Jan 4 and still going. Are you growing your hair longer? I like it. I never seem to make a conscious decision to let my hair grow…just too lazy to make an appointment to get it cut 😉 Hope the trial is going well! .-= Esme´s last blog ..February is the time for Love =-. Hahaha. Very funny post! My wife just loves your posts. Thanks for sharing with us your thoughts because we always find them very interesting and informative. Well, another this that is great with nutella is that you can have espresso coffee with it anytime. Have a nice day! .-= Michael Cavinta´s last blog ..Why cold brew coffee is getting popular =-. Sub ready made Bird’s custard and I’m with you for the whole damn list. Add Ambrosia rice pudding in a tin and I can write a wad of new additons. .-= Sarah in Italy´s last blog ..Bob da Builda M =-. oh my geeez! I am literally laughing out loud! Nutella doesn’t point out when a big chunk in his middle has been taken out with a spoon. DH loves to remind me of that one! Ouch! Glad you enjoyed the list, Em! .-= Em from Ribollita Reboiled´s last blog ..Kiss My Polenta (Grits) =-. nutella will NEVER EVER leave the toilet seat UP. nutella is a liar though. hazelnuts is 3rd ingredient after sugar and oil. it is essentially frosting. sold as peanut butter but its not, its just frosting. But where does Nutella lie about any of that, Fred? The ingredients are listed on the side of the jar, and it’s sold as a chocolate (sugar implied, no?) hazelnut spread–in that order. I don’t think anyone is shocked to learn that something with a chocolate base has a lot of sugar…or at least they shouldn’t be. hey liked this, so did Sara rosso as she put in the her book,” the unofficial guide to nutella” she is selling on amazon. Did she have your permission? 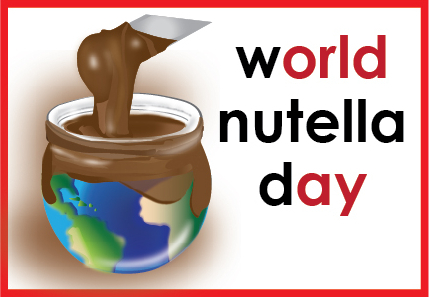 Pingback: Greenhoof » Blog Archive » Happy Nutella Day. Now What Is It?